What is FBA Inventory Valuation? 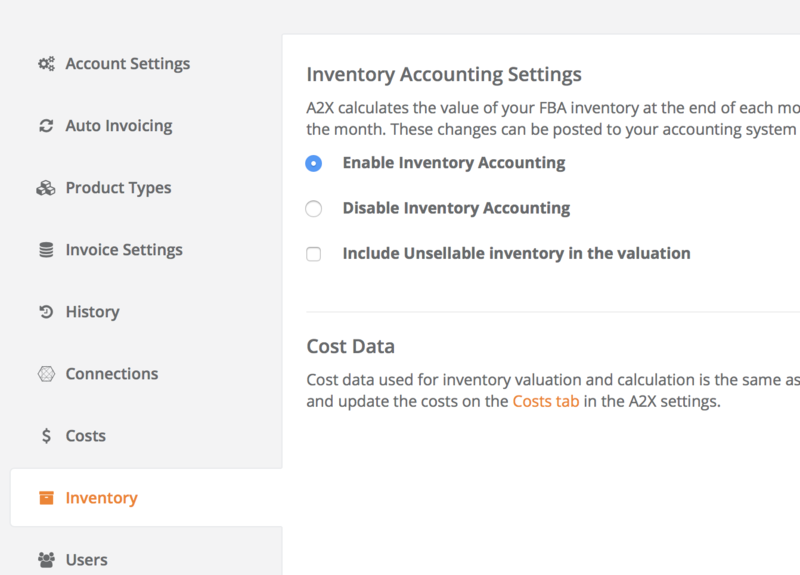 A2X will automatically fetch the month-end stock-take data from Amazon for your FBA inventory and use your uploaded cost data (from your Cost of Goods Sold cost file) to calculate an inventory valuation for the stock held by Amazon in FBA. You can also configure A2X to include or exclude unsellable stock at FBA depending on whether you place a value on it while it is unsellable. How to access FBA Inventory Valuation? In 2018, the inventory valuation features became available as a standard offering on the Starter, Standard and Premium plans. To access the Inventory features first you need to enable it in the A2X settings under the Inventory tab. Upload costs in the same way as COGS, in order to calculate the monthly valuation. Once enabled, the Inventory menu includes your monthly stock-take summary and FBA locations. In the Inventory > Monthly Summary screen you can see a table of each monthly stock-take. The table shows the total unit count, the total SKU count, the number of countries the stock is located in and the status of the cost data (i.e whether all SKUs in the stock-take have corresponding cost data). The full FBA stock-take calculation can be reviewed for each month. Showing in detail how many units of each SKU were sellable and unsellable, and what value of stock is available. In the Inventory > Locations screen you can see a table and map of all Amazon warehouses where the stock is located. A2X uses monthly inventory data to determine likely Amazon warehouse locations where your stock is being stored by Amazon. A2X presents these locations on a map and in a summary table.